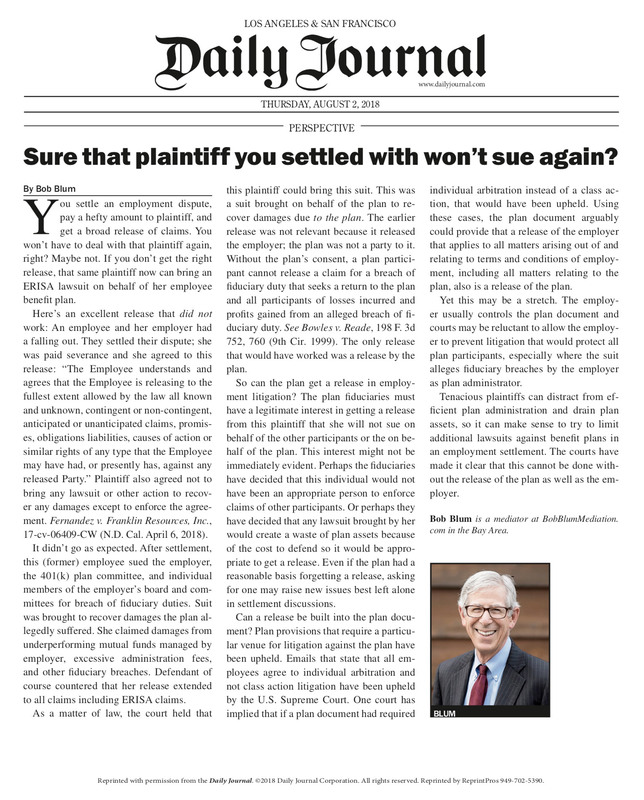 Sure that plaintiff you settled with won’t sue again? 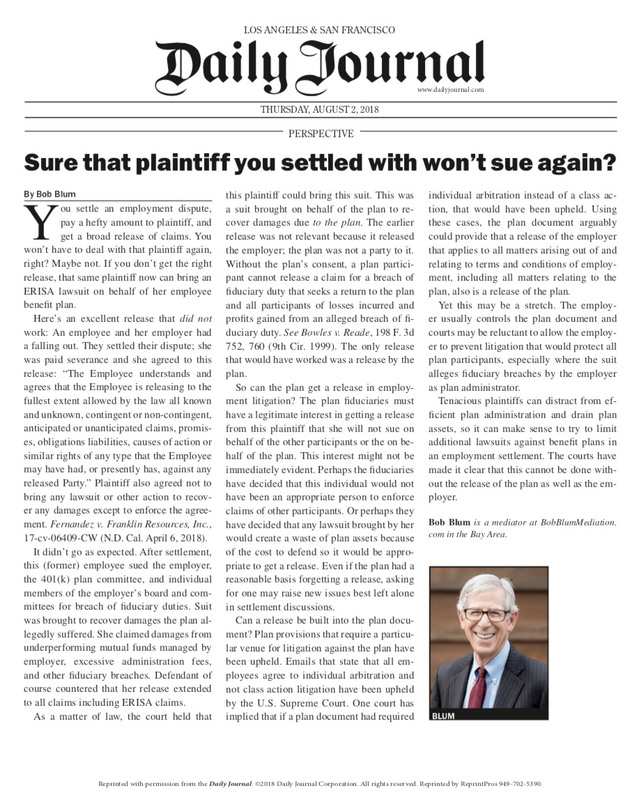 Generally, plaintiffs in employment cases must report as taxable income the total judgement or settlement – before paying their legal fees and costs. Therefore, income tax withholding and Social Security and Medicare (“FICA”) taxes may be due on the “top line” judgement or settlement even though plaintiff’s net recovery after fees can be much less. The IRS has blessed tax planning that will lower plaintiff’s and employer’s taxes and perhaps simplify plaintiff lawyer’s taxes. This may make it easier to settle a case. Take a simple case: Plaintiff settles an employment action for back pay for $100,000 and pays her lawyer $30,000; she nets $70,000. The Supreme Court says that plaintiff has $100,000 in taxable income (except in limited cases where recovery is tax free). Commissioner v. Banks, 543 U.S. 426 (2005). While plaintiff will get a deduction for legal fees and ultimately will pay tax on the $70,000 that she gets, the way that her recovery is structured affects her taxes. The goal is to draft the settlement agreement so only her net $70,000 recovery is subject to income tax withholding and FICA taxes. With lower income tax withholding, plaintiff will have more cash immediately, and with proper structuring both her and the employer’s FICA taxes will be lower. The key to lower taxes is the way that the settlement provides for the payment of legal fees. (These same rules apply to judgements.) Without planning, the IRS will require income tax withholding on our plaintiff’s $100,000 and will require FICA taxes on $100,000. But she wants withholding and FICA taxes only on the $70,000 that she gets after paying legal fees (eventually she will get a deduction for her legal fees).. Here’s how. The IRS has said that if the settlement agreement clearly allocates part of the settlement amount to stated amounts of legal fees and if those fees are paid in a separate check made payable to the lawyer, then income tax withholding for our plaintiff will only be on $70,000. FICA taxes also will only be on $70,000, good for both our plaintiff and the employer. To match this taxation with the Supreme Court’s Banks rule, the employer’s tax reporting to the IRS for the plaintiff will be done in two parts: a W-2 for $70,000 and a 1099 for $30,000. The employee still has $100,000 of income but has gotten immediate tax relief for paying her legal fees by lower withholding. She and her employer also have gotten lower FICA taxes, and this may have made settlement easier. IRS Chief Counsel Memorandum 20133501F (July 11, 2013) and Rev. Rul. 80-364, 1980-2 C.B.294. With a clear allocation to legal fees and separate checks, taxes also are simpler for her plaintiff’s lawyer. He gets a 1099 from the employer for $30,000, only. In other situations – discussed below – her lawyer can receive a 1099 for $100,000 which complicates his tax life. What if the lawyer has not yet tabulated his fees at the time of settlement, or what if the lawyer and client have not agreed on the final amount of fees and costs? The short answer is – do the best you can. If there is agreement on the base fee and costs, put that part in the agreement and have it paid as a separate check and work out the rest later. What if the client does not want the defendant to know her fees and costs? That does not fit with the IRS rule so higher taxes will be paid. The IRS has also said what will not work to reduce taxes. If there is one check for $100,000 payable jointly to the plaintiff and lawyer, then both the lawyer and the plaintiff get a tax report for $100,000. The plaintiff gets a W-2 and the lawyer gets a 1099, each one reporting $100,000 for a total tax reporting of $200,000. The IRS was silent on the case where there is a joint check to plaintiff and the lawyer and the settlement agreement clearly allocates legal fees. So the resulting income tax withholding and FICA tax payment are uncertain. Before settling any case, get expert tax advice. A bit of planning often can reduce taxes and save unnecessary cost. Important note — This article does not give tax advice – always work with your tax advisor because taxes depend on each person’s particular facts. 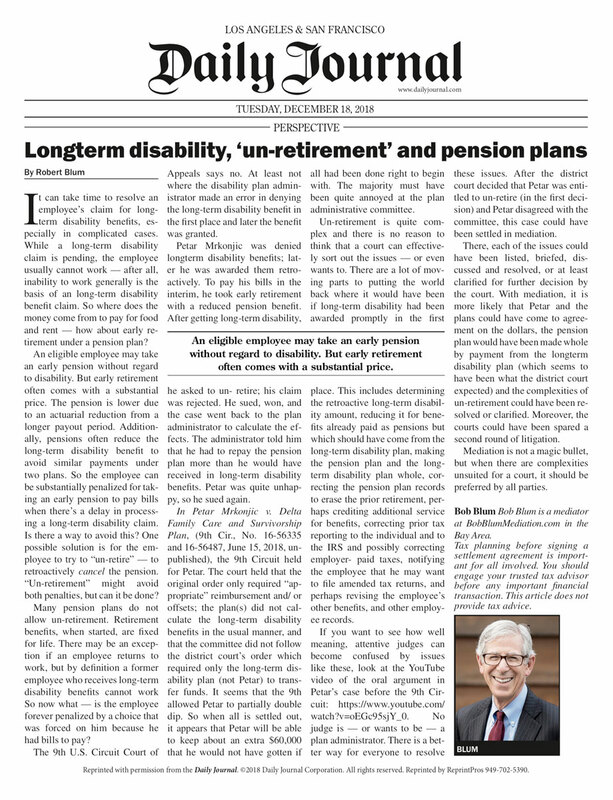 The Pension Plan Is Paid In 35 Years but The Lawyers Are Paid In 2 years – Is this Right?